Isn't it funny the memories that we associate with certain foods? For me, fudge will always remind me of the Boy Scouts. Sound strange? It's because when I was growing up, the Boy Scouts in my church would do a "fudge drive" every year to pay for camp. They probably made hundreds of pounds of fudge in one night and sold them for $4 per pound. I remember our family always buying at least a couple pounds. I also remember the year I had my own money and could buy my own pound so I didn't have to share with my brothers. That was the best part! Last week, while at my parents' house, my mom had her own pound of fudge for us to snack on. Unfortunately, my mom's favorite kind of fudge is Rocky Road. I hate nuts in my fudge. To me it's just wrong to ruin a good batch of fudge with nuts. But, to each his own. 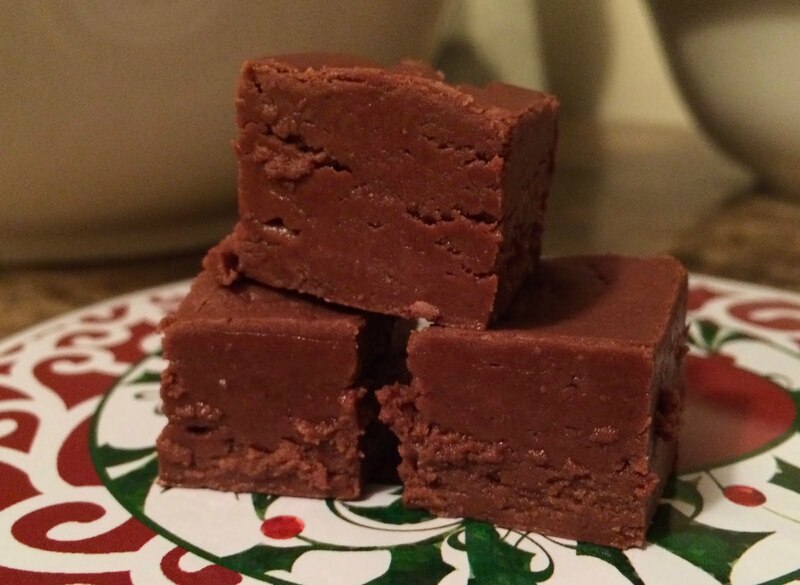 While there are a million fudge recipes out there, this is the one our Boy Scouts made, and so will always be my favorite. I usually put the fudge into five tins, one pound each, but since I was going to be sharing this at a party, I decided to pour it into a 9x13. I lined it with parchment paper to easily lift out and cut. 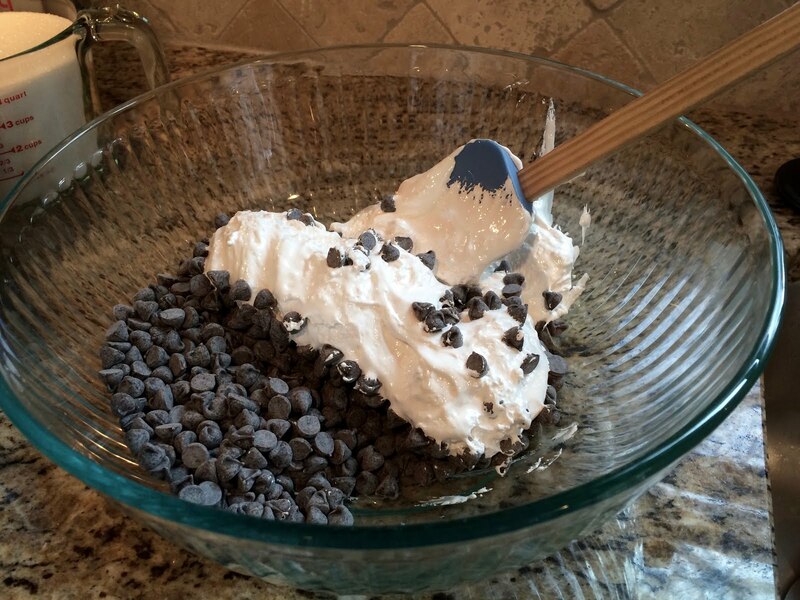 It's easier to prep the chocolate chips and fluff in a large bowl first so it's ready. 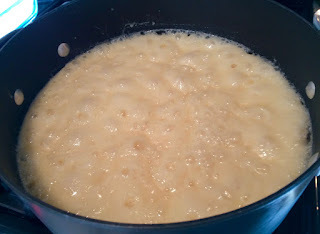 Then set the butter, sugar, and evaporated milk to boil over medium-high heat. Cook, stirring slowly to prevent burning, for six minutes. Do this next part quickly before it sets! 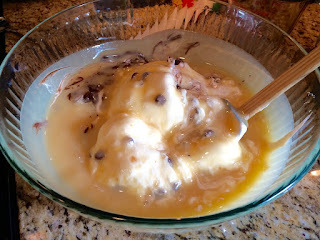 Add the hot sugar mixture to the chocolate and fluff. 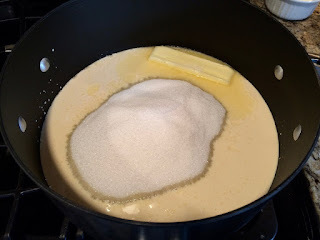 Mix completely and then add the vanilla and salt. This made plenty to take to both parties and still have a tin full at home. In large, heavy saucepan, combine butter, sugar, and evaporated milk over medium high heat. Bring to full boil and cook, stirring slowly, for 6 minutes. Remove from heat and add to bowl with chocolate chips and marshmallow fluff. 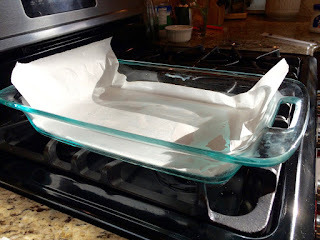 Add vanilla and salt and pour into 13x9 pan. Allow to set. Yum! 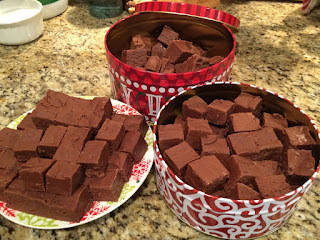 I associate fudge with holidays, great time for this recipe. 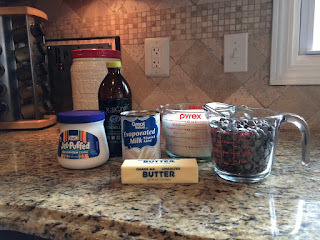 This is the recipe my mom always made and the one I make as well. Quick and easy! Thanks for sharing the recipe with SYC. Hi Jann! I love when favorite recipes are passed around and used over and over again. Thanks for visiting!